announced on Saturday that the Russian Federation is also suspending its participation in the treaty in a mirror response to Washington’s unilateral decision. 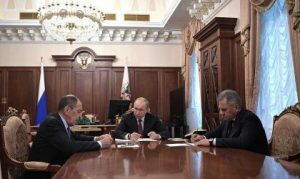 The INF treaty, together with the Strategic Arms Limitations Talks/Treaty (SALT treaty), signed by Washington and Moscow on the issue of long-range missiles, aimed to create a safer global environment by seeking to avoid the prospect of a nuclear exchange. It was also aimed at reducing the number of nuclear warheads owned by the US and the USSR, as well as generally reducing proliferation in line with the Non-Proliferation Treaty (NPT). 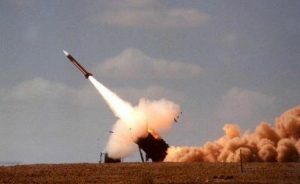 In particular, the INF treaty guaranteed a lasting peace on the European continent through Washington not deploying nuclear weapons in Europe aimed at the USSR, and Moscow in turn not deploying systems capable of eliminating these European-based US missiles. The initial promoters of an INF agreement were obviously the European countries, who would have found themselves in the middle of a nuclear apocalypse in the event of war between Moscow and Washington. The American and European mainstream media have applauded the withdrawal from the INF, in the same way that they have applauded Trump whenever he has been pro-war. Former CIA and military personnel, as well as the former CEOs of major arms manufacturers, have been eager to share their views as “experts”, literally invading television programs and thereby showing why they are paid lots of money to lobby for the military-industrial complex. They praised Trump’s move, blaming Moscow for the ending of the treaty, but in the end revealing the covert geopolitical reason why Washington decided to end the deal, namely, the fact that China is not bound by the same treaty. 2014, the attention of so-called US experts has been focused on the 9M729 missile (pictured) in particular, an evolution of the 9M728, used by the Iskander-K weapons system, a Russian technological gem with few equals. NPO Novator, the company that produces the 9M729, asserts that the missile does not violate the INF treaty and has a range shorter than the 500 km limit (470 km). Moscow even organized an exhibition open to the public, with the missile on display along with its main features, inviting Washington to officially send its experts to view the characteristics of the 9M729. Washington refused, knowing full well that the missile does not violate the the INF, preferring instead to use the 9M729 as an excuse to abandon the treaty. In the specific case of withdrawing from the INF, there is little need to raise a big hue and cry, as was the case with the Paris Agreement, since the media-intelligence-military apparatus has a lot to gain from this. This just goes to show how the MSM and their rolled-out “experts” thrive on war and the money that is to be made from it. There is a major psyop going on to convince the American public that the withdrawal from the INF treaty, and the resulting arms race with major nuclear-armed countries, is apparently the best way to keep America safe! Korea), was an excuse to deploy the Aegis system (land- or sea-based) in strategic areas around the Russian Federation, so as to diminish Moscow’s deterrent capacity for a nuclear second strike. 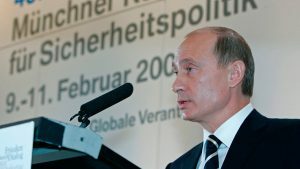 caused Putin to make his famous 2007 Munich speech, where he warned the US and her allies of the consequences of reneging on such treaties and agreements. Deploying defensive systems close to the Russian border that can easily be converted into offensive ones with a nuclear capacity was a red line that could not be crossed. The US military-industrial complex is rejoicing at the prospect of money raining down as a result of this withdrawal from the INF treaty. But in Europe (with the exception of Romania and Poland), nobody is too keen to welcome US missiles that have no defense against Russian hypersonic weapons. NATO’s trans-Atlantic arms lobby will try to push as many European countries as possible towards a new Cold War, with US weapons deployed and aimed at Moscow. It will be fun to see the reactions of European citizens facing the prospect of being annihilated by Russian missiles simply to please the CEOs and shareholders of Lockheed Martin and Raytheon. No doubt there will be some European politicians in countries like Poland keen to scream about the “Russian threat”, ready to throw tens of billions worth of Polish taxpayers’ money into useless and ineffective projects for the purposes of pleasing their American friends. The withdrawal from the INF treaty is another worrying sign of the willingness of the US to push the world to the brink of catastrophe, simply for the purposes of enriching the CEOs and shareholders of its arms manufacturers through a nuclear arms race.